Late June Blooms in Jackson Hole! Throughout Jackson Hole native plants are flowering in abundance due to plentiful May rains and now the unseasonably hot weather. We have picked only a few highlights. There is much more to observe. Snowbrush Ceonothus- Ceonothus velutinus – covers the burn area of the 1999 Alder Fire located south and west of String Lake. You can also see Snowbrush in another burned forest on the way to Bradley and Taggart Lakes. Not only are the flowers showy, but also the fragrance is heavenly. Seeds of Snowbrush Ceonothus – Ceonothus velutinus – can remain dormant in soil for decades, ready to sprout after a fire. Mature plants cover the moraine by String Lake, Grand Teton National Park. Snowbrush Ceonothus has elegant clusters of white flowers and 3-4″ leaves with three strong veins and a glossy texture on the surface. Buds and leaves can be sticky with resin, which provides a different fragrance. Another big show is Mulesear Wyethia (Mulesear for short). 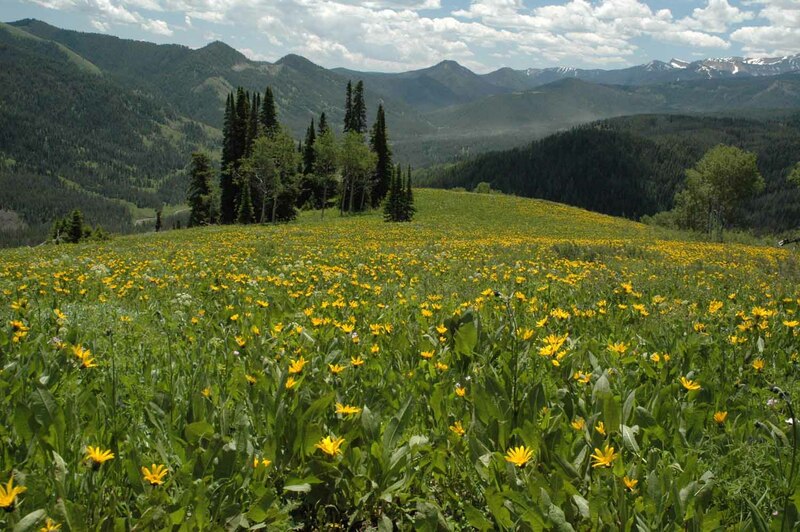 Mulesear looks to many people like the popular and plentiful Balsamroot because of its big yellow sunflower-like flowers and its large leaves. 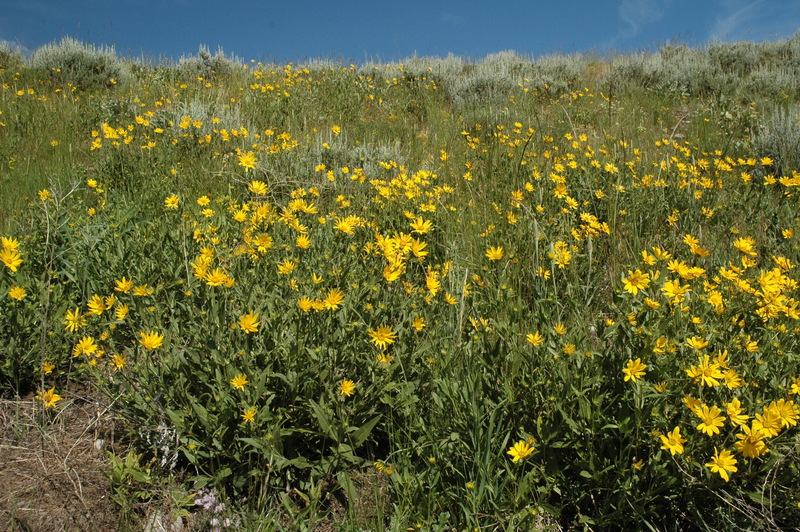 However, Mulesear has darker yellow ray flowers, glossy green elliptical leaves that grow up the stems compared to paler yellow flowers and arrow-shaped, gray-green leaves that grow only from the base of Balsamroot. Importantly, Mulesear grows in heavier clay soils vs. the well drained soils where we find Balsamroot. 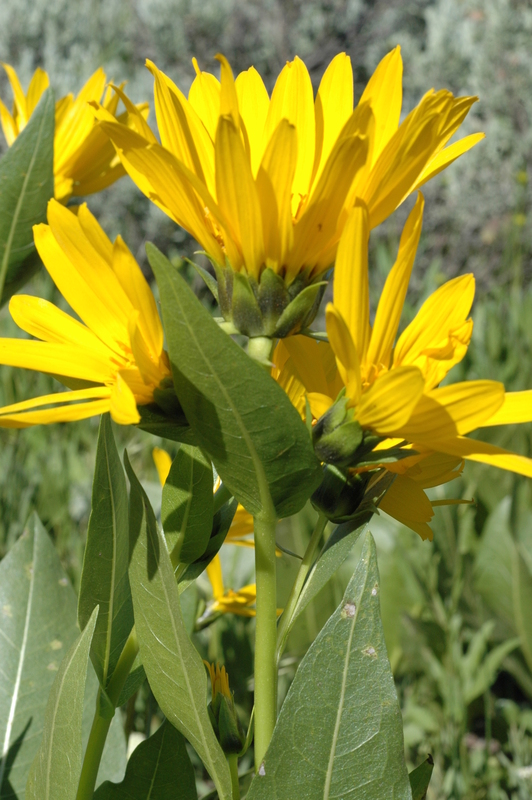 Mulesear Wyethia – Wyethia amplexicaulis – has large, dark yellow flowers and 12-18″ elongate, deep green leaves (the size and shape of mule’s ears!). It grows in heavier soils than the look-alike Balsamroot. Cliff Creek drainage in the Bridger-Teton National Forest south of Hoback was magnificent last week. These mountains consist of sedimentary rock which breaks down into clay particles, forming heavier soils. Note in the distance the mist of pine pollen wafted on the wind. 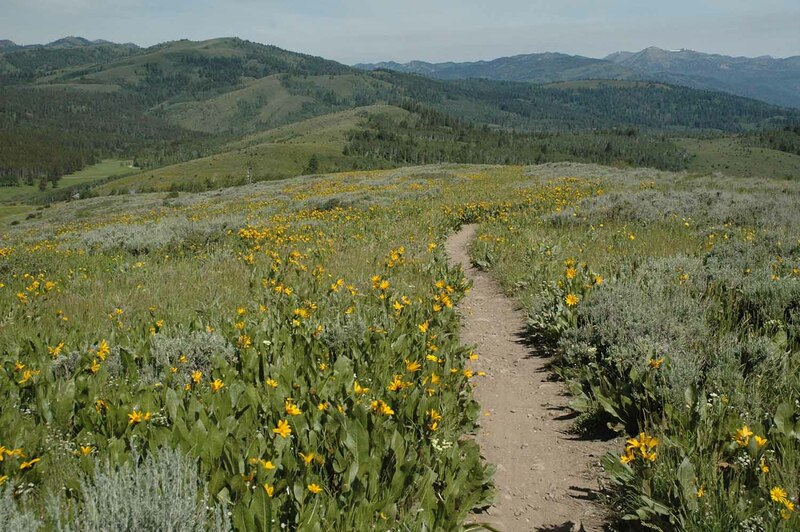 Wally’s World trail off Fall Creek Road near Munger Mountain was full of wildflowers June 20. 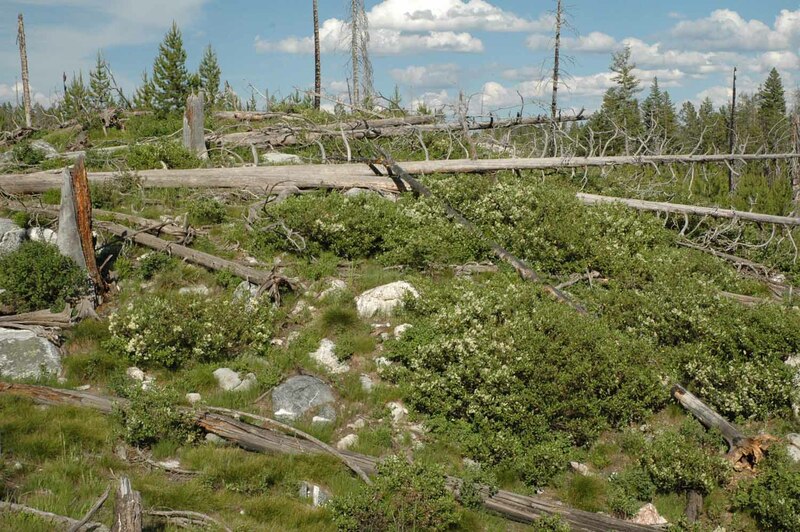 You can also see stands of Mulesear along the highway near Antelope Flats Road and up by Cattleman’s Bridge near Oxbow Bend in Grand Teton National Park. The glacial outwash plains of Jackson Hole within Grand Teton National Park are in full bloom. Amidst the silvery Big Sagebrush (Artemesia tridentata var. vaseyana), is a tapestry of color: creams, blues, yellows, reds, maroons. The plant composition varies but the following species are typical at this time. 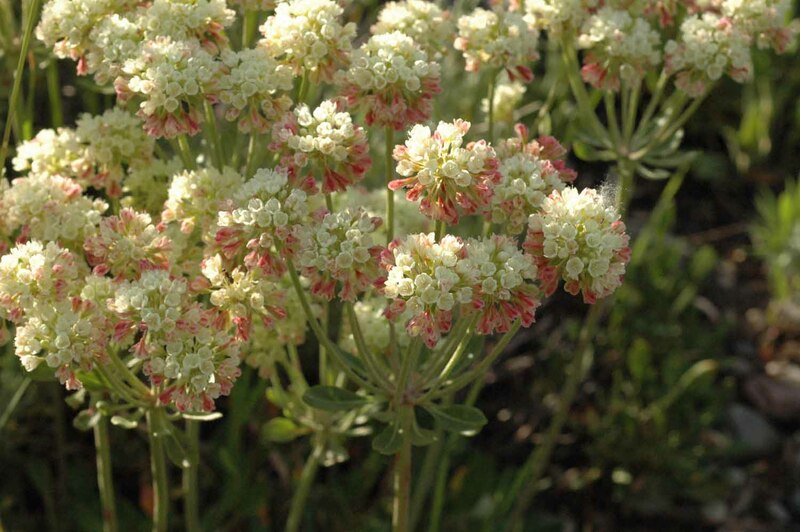 Sulphur Buckwheat – Eriogonum umbellatum – forms mats of small oval leaves and clouds of creamy yellow flowers which are often tinged with pink. 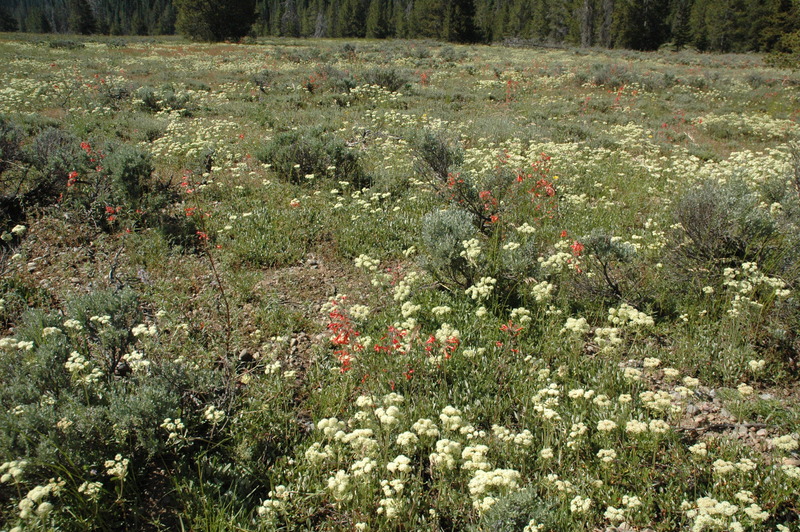 Sulphur Buckwheat is blooming throughout the valley. Note the whorl of leaves just below the inflorescence or flower cluster. Sulphur Buckwheat and Lance-leaved Stonecrop are overtopped by many grasses at the beginning of the Bradley-Taggart Trail. Grasses seem more abundant this year compared to 2014. Several species of grasses are in full bloom, although the flowers are naturally inconspicuous. Grasses count on the wind for pollination and the wind cannot see or smell, so no fancy colors , patterns, or scents are necessary. 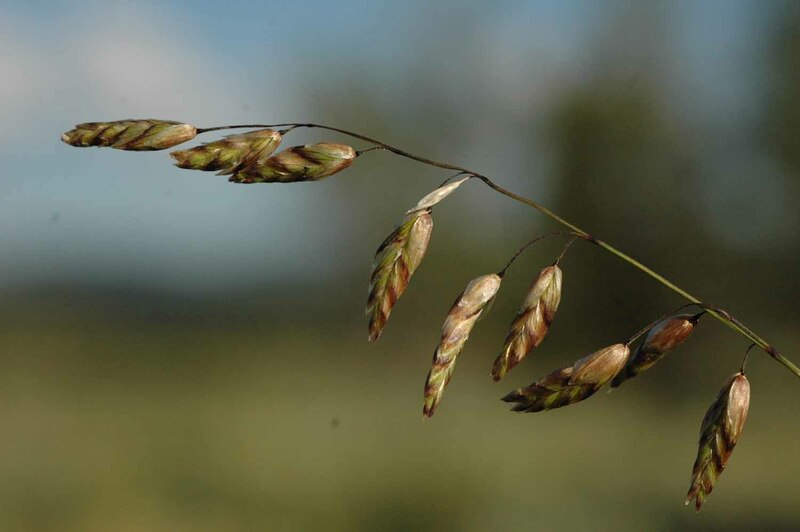 Even so, close up, Melicgrass –Melica spectabilis – has elegant, dangling spikelets of individual flowers. Light, wind-dispersed pollen is causing hay-fever (hay comes from grasses!) in many people right now. Lance-leaved Stonecrop – Sedum lanceolatum – is tucked below the taller plants. 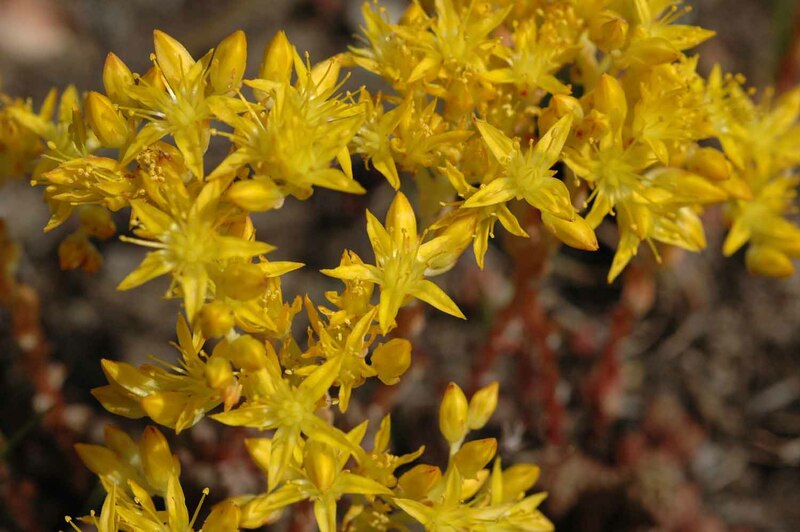 They have succulent 1/2″ leaves on 6-8″ stems and bouquets of 5-parted, star-shaped yellow flowers. Members of this desert-adapted plant family have a very different metabolism than most other plants. Look up “CAM- Crassulacean acid metabolism” on the internet to find out more! 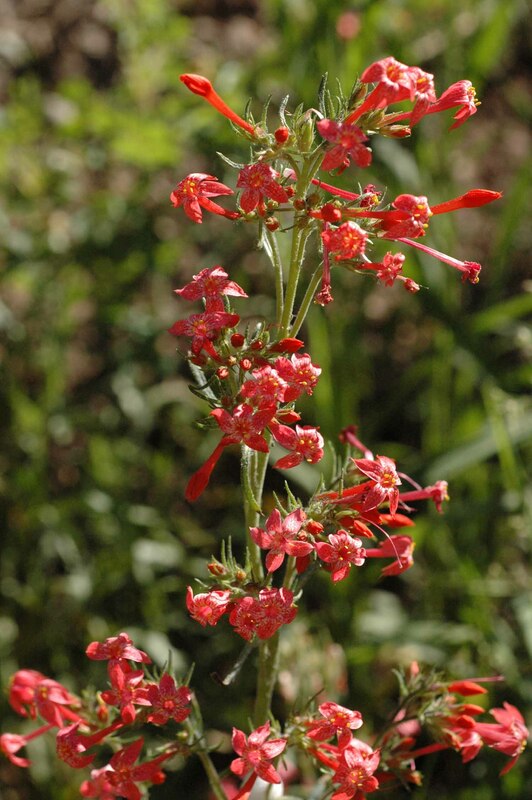 Scarlet Gilia – Ipomopsis aggregata – attracts hummingbirds. Birds see red (insects don’t) and the stiffly arrayed tubular flowers enable hummingbirds to hover while lapping up nectar deep within. In the process of drinking the high-test nectar, the forehead of the bird bumps the protruding yellow anthers, collecting pollen. Upon the bird’s next visit, the next flower may have a long stigma to which the pollen will stick. With luck, the pollen tube grows and fertilizes the egg deep inside the plant….fertile seeds then form! The south end of the Park Road includes tall accents of Scarlet Gilia, as well as plumes of creamy Sulphur Buckwheat. 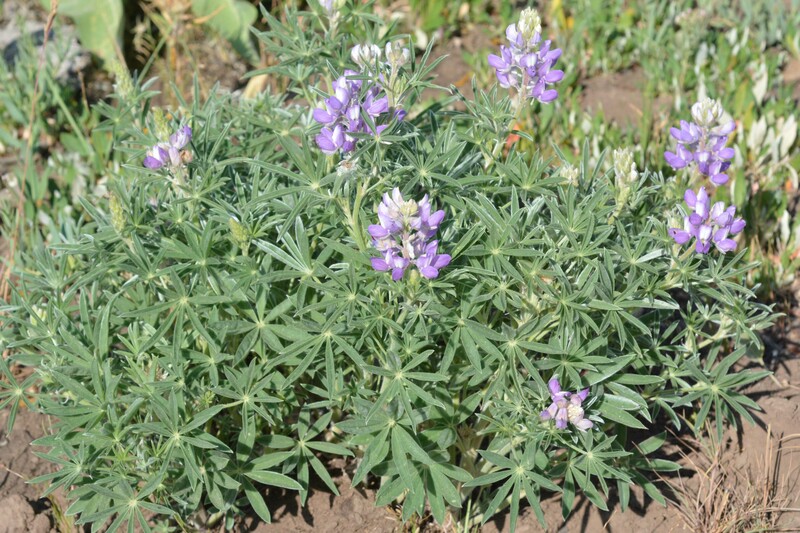 Silky Lupine – Lupinus sericeus – is typical of sage flats and dry hillsides. It has hairs on the backside of the “banner” of the pea-like flowers and very hairy palmate leaves. As of this posting, I have seen few plants flowering compared to last year. Are you finding it? 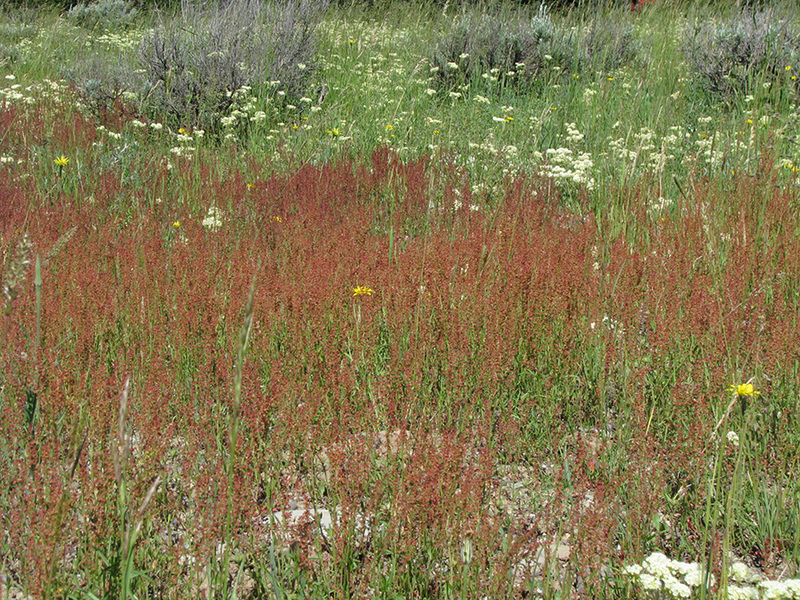 Sheep-sorrrel – Rumex acetosella – adds another color to the tapestry. A plant of disturbed soils, it is a non-native species. 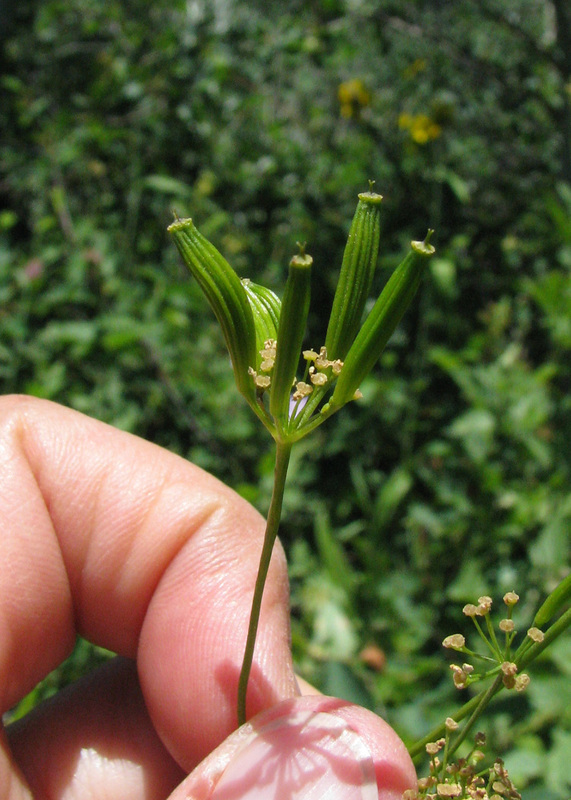 Plants have tiny either males or female flowers . Take a close look to find anthers (male) or stigmas and ovaries (female). Sheep-sorrel happens to be in the same family – Polygonaceae – as Sulphur Buckwheat – Eriognoum spp. 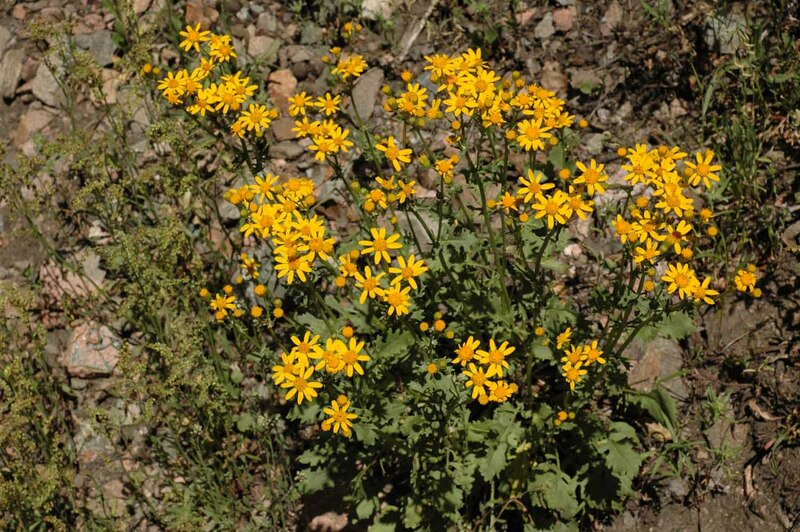 Bright yellow Rocky Mountain Groundsel – Packera (formerly Senecio) streptanthifolia – pops up in odd corners of the sage flats, such as Lupine Meadows. The leaves vary greatly in their shape and incisions. The “flowers” typically have only 8-10 “petals” or ray flowers, per head. 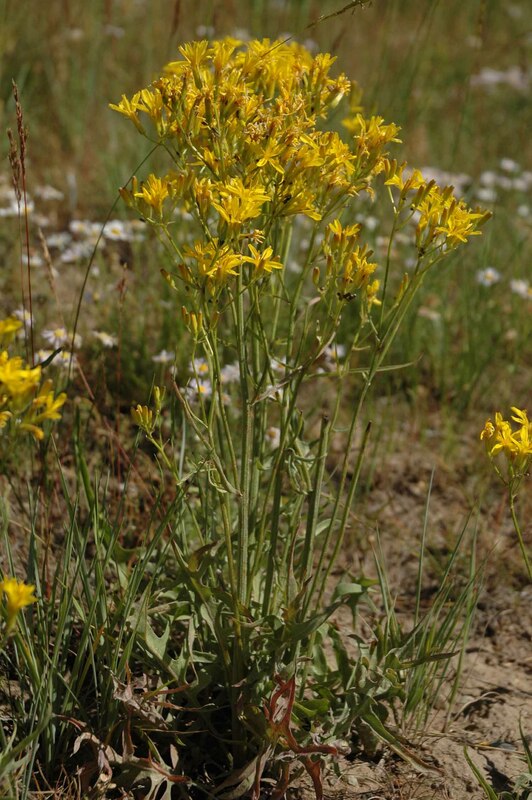 This species of Hawksbeard – Crepis aggregata – is common along the Gros Ventre Road. Note the sword-shaped, deeply lobed leaves at the base of the plant. The dozens of flower heads have only a few ray flowers each. One-flower Sunflowers or Helianthellas – Helianthella uniflora – are 2- to 3-foot tall bright spots in the sage flats along Gros Ventre Road. They also are found along dry river benches and lower slopes of the buttes. It’s more robust relative – Five-nerved Helianthella – H. quinquenervis – blooms here and there. Look for the 5 strong nerves on the large lower leaves to help distinguish the two. These last three yellow species are all members of the Aster or Sunflower Family. It is fun to compare their flowers, leaves, and habit (size, shape, and posture) of these relatives. Aspen stands are particularly welcome oases. The dappled light created by the shimmering deciduous leaves and the more alkaline soils compared to the pine forests nurtures a rich array of flowers. The trees themselves are homes to many woodpeckers which in turn create holes for nesting House Wrens, Mountain Bluebirds, and Tree Swallows. Stands of Aspen – Populus tremuloides – feature a rich array of flowers and birds. The mix of species varies from place to place. This shot is taken on the west slope of Munger Mountain. 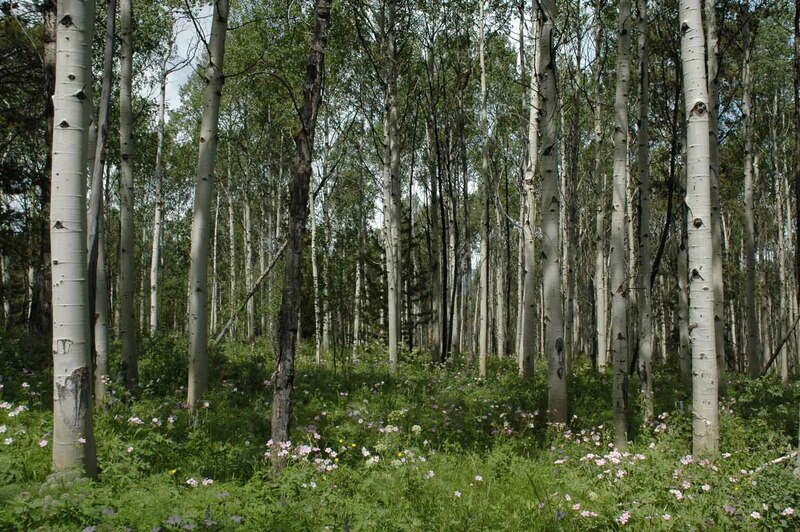 Aspen are easily seen at Cascade Canyon Trail Head, Oxbow Bend, and Two-Ocean Lake Road in GTNP. 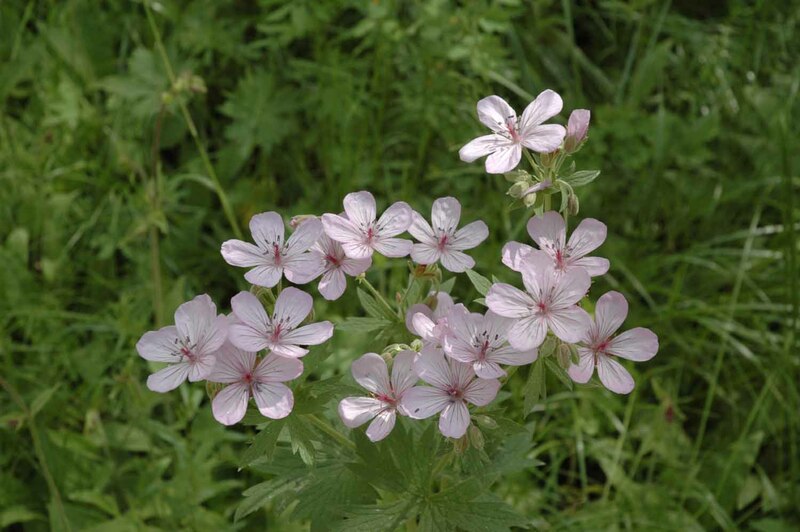 One of the most common flowers in aspen groves, meadows, and sage flats is the Sticky Geranium. Sticky Geranium – Geranium viscossissimum – is common throughout the valley. Its wide open petals with obvious nectar guides form landing pads available to many types of pollinators. Two members of the Parsley Family are found in open forests. 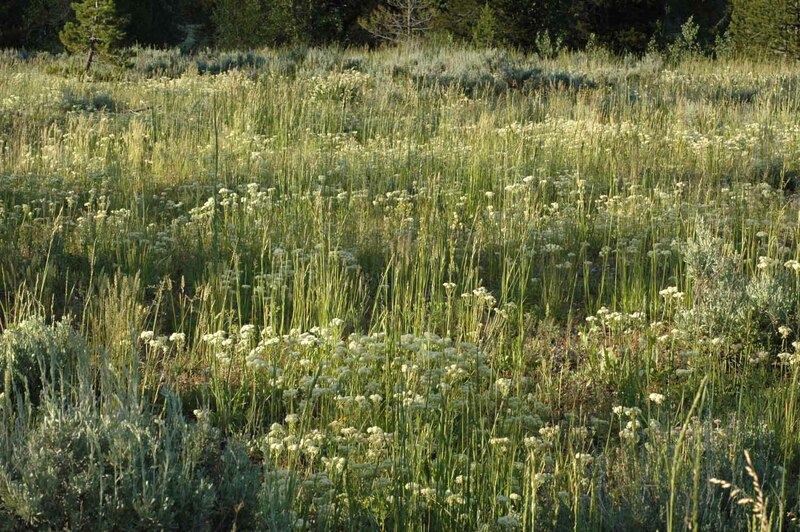 Can you figure out from the pictures below why it was once called the Umbelliferae Family? 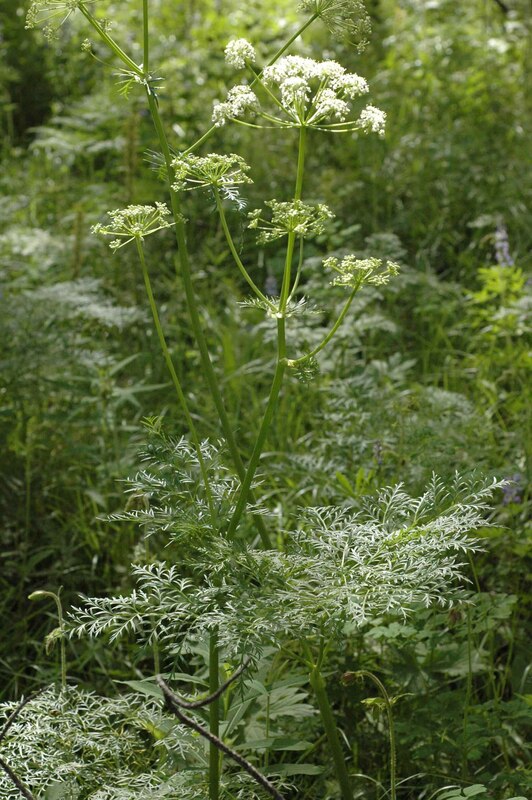 Fernleaf Lovage – Ligusticum filicinum – is a tall – 3- to 5-foot plant with ferny, greatly dissected leaves. The white flowers held on wide umbels are equally as delicate. 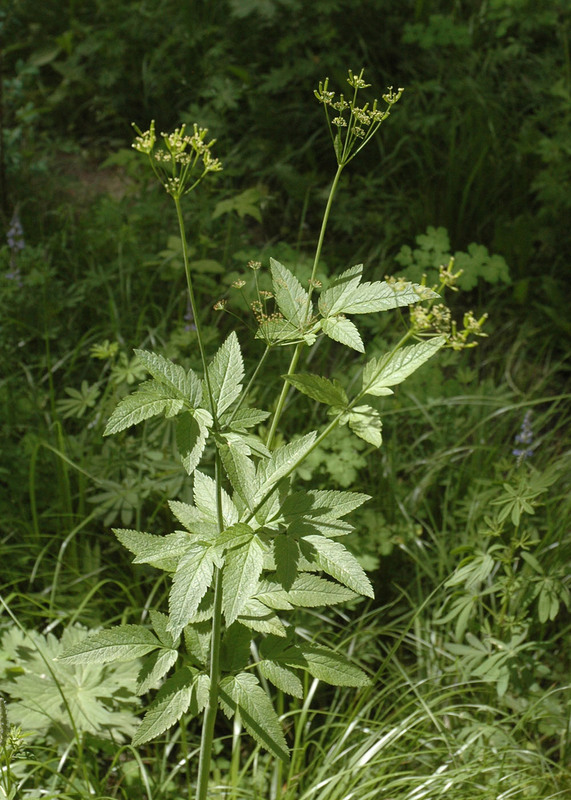 Related to Fernleaf Lovage, Western Sweetroot, Wild Licorice – Osmorhiza occidentalis – has delicate yellow-green flowers in umbels. 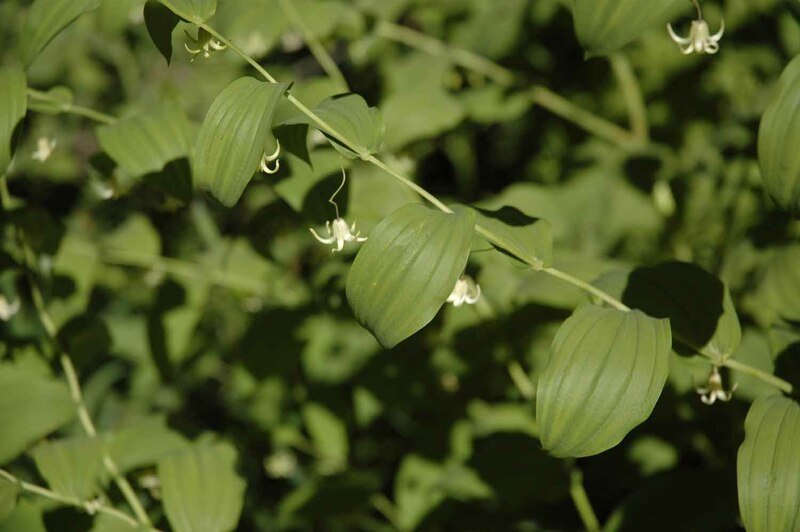 The compound leaves are much less divided and have the fragrance of anise or licorice, as does the root. True licorice comes from a member of the Pea Family, not the Parsley Family. Note the elongate, ribbed, smooth fruit. Western Sweetroot or Wild Licorice – Osmorhiza occidentalis – is a member of the Carrot or Parsley Family. As with many members of this family – anise, caraway, dill – the seeds are filled with flavor. Try a taste! Two members of the Orchid Family can be discovered along trails in aspen groves and elsewhere if you are lucky. Both are small plants with only a few 1-2′ stems of a reddish to fleshy hue. They have no chlorophyll but depend on a fungal relationship to nourish the plants. Coralroots get their names from their knobby roots. 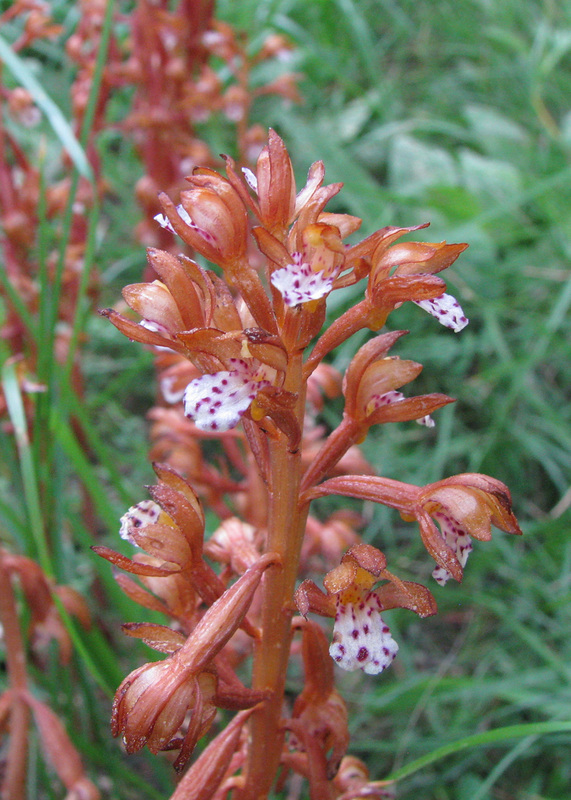 Spotted Coralroot – Corallorhiza maculata – is variable in its decoration. However, a lobe on each side of the base of the lowest petal (lip) and a bump (spur) under the throat of the flower help confirm ID. 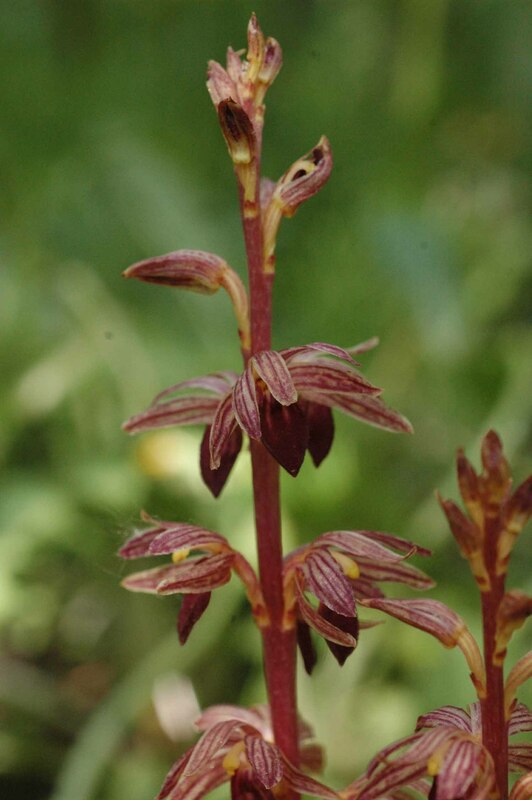 Striped Coralroot – Corrallorhiza striata – is the largest of 5 species of Coralroot in Teton County. This reddish plant has no chlorophyll, but rather depends on a fungus to relay nutrients from other plants nearby. 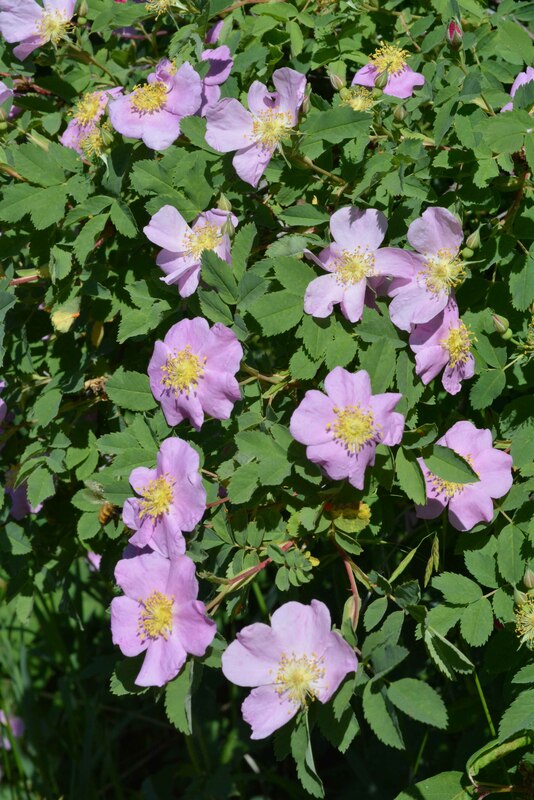 Woods Rose – Rosa woodsii – flowers in abundance along roadsides. Many pink flowers are clustered together at the tips of twigs. Another rose species with sparsely prickly branches bares flowers individually: Nootka Rose – R. nutkana. 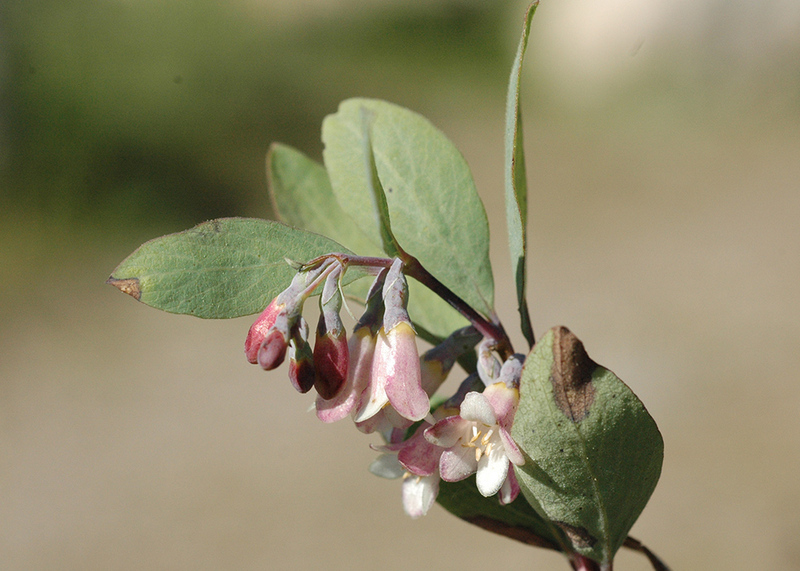 Mountain Snowberry – Symphiocarpus oreophilos – a 2-3 foot shrub with opposite oval leaves is blooming in both shade and sun throughout the valley. 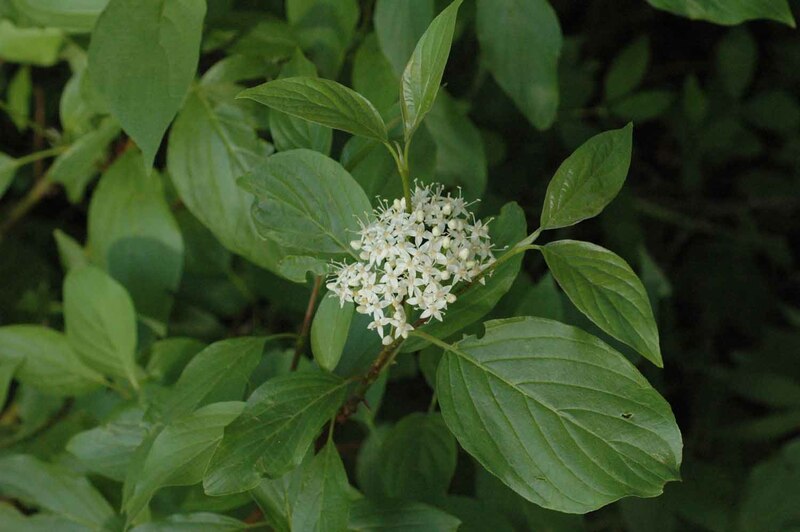 Red-stemmed Dogwood – Cornus stolonifera – is a favorite food of browsing moose, as my ornamental plantings attest. 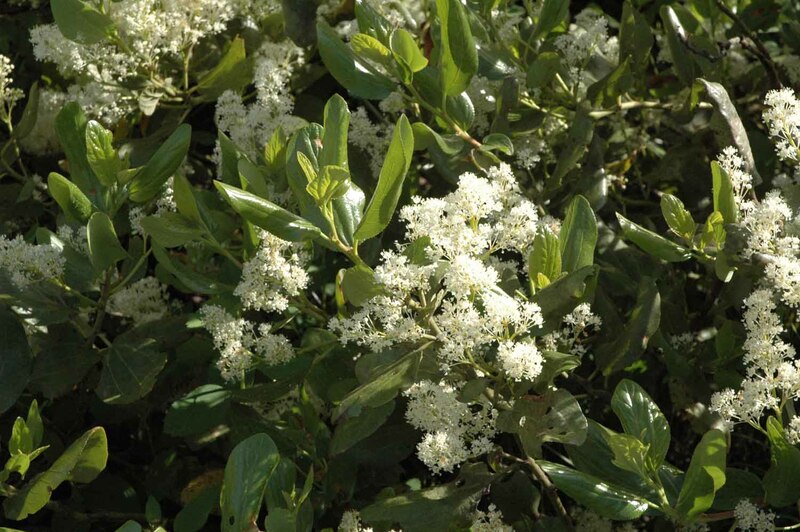 This wetland shrub is easy to identify with its opposite oval leaves with parallel veins and clusters of 4-petaled white flowers. White Bog Orchid – Platanthera dilatata – is found in wet spots. The small white flowers have a lip or lower petal that is expanded near the base, and a spur extending underneath. 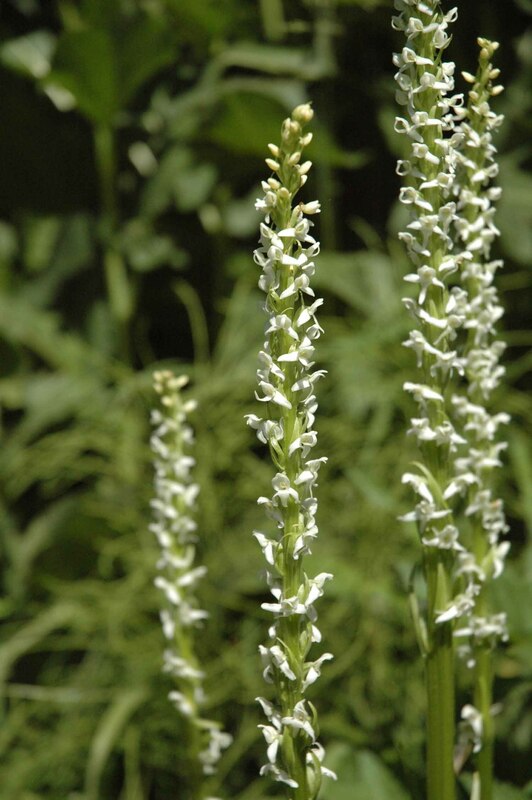 The lovely fragrance clinches its identity as White Bog Orchid. Clasping Twisted Stalk – Streptopus amplixifolius – graces the edges of streams. The kinked stalk to the flower gives it its name. 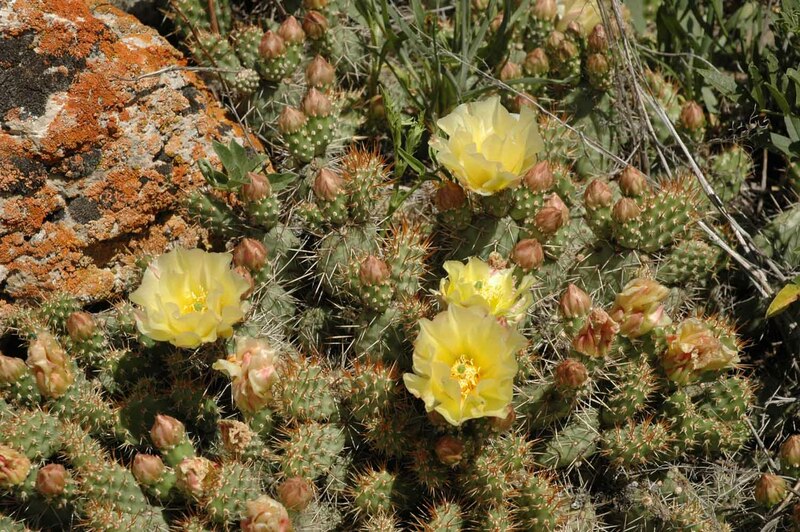 Prickly Pear – Opuntia fragilis – is in bloom on the ledges by Kelly Warm Springs. The flower is gorgeous. The pad-like stems break off easily (fragile) to help in dispersal. They will attach readily to you: do not touch! Hiking up Cliff Creek, by chance we didn’t step on this 3-4″ wonder. 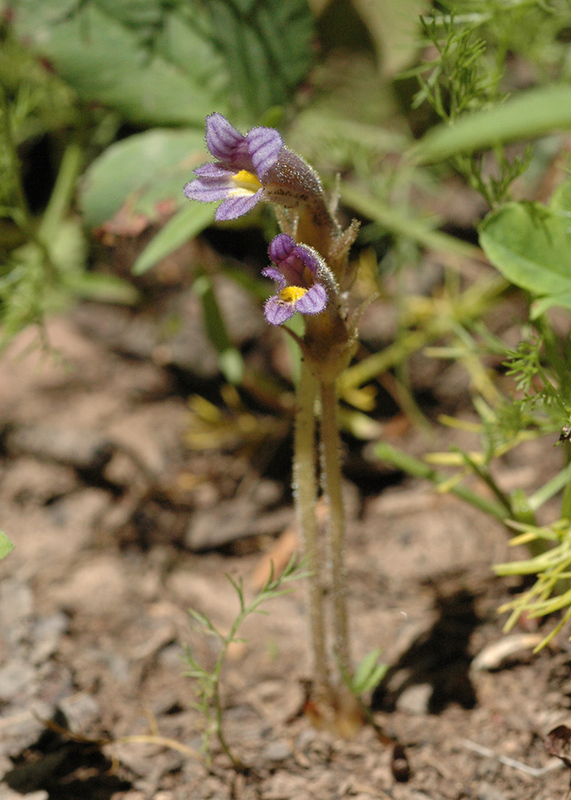 One-flowered Broomrape, Ghost Plant – Orobanche uniflora – is a mysterious species of an odd family. Scientists don’t even know if it is an annual or perennial. Perhaps it lives more than one year, but after it flowers it dies. It is unclear what pollinates it, or if it pollinates itself. Without chlorophyll, the plant attaches to other species for its food. Apparently it is not picky as to its host plants. It is a rare species in several states. There is much more to see, but only so much time to write. Hopefully, this posting will provide incentive for you to go and see for yourself what is in bloom. We appreciate your photos (between 500k to 2-3 mb–please not larger) and any identification questions or pointers of where to see them–tetonplants.org. We can post them too!